How did the Charlotte metro area's housing market perform in 2017? Here's the 2017 market "at a glance." All the critical indicators of a robust housing market show improvement year-by-year since 2011, with the exception of the inventory of homes available for sale, which has dropped now for FOUR years in a row. With only two months of inventory, in my mind this is the most critical aspect of our market right now -- availability of homes for buyers to purchase. And it's the supply of homes, or rather lack thereof, that is helping drive Charlotte are home prices up and the housing affordability index down as demand continues to outstrip supply. Closed sales are also being impacted negatively due to the lack of inventory. 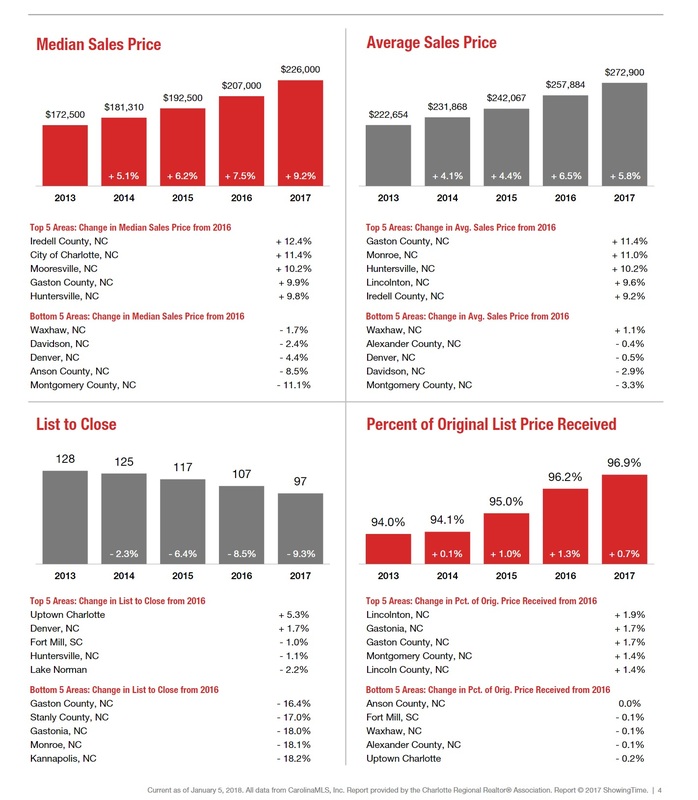 This Charlotte, NC region housing market update for 2017 is brought to you by Nina Hollander and Carolinas Realty Partners,Coldwell Banker, your Charlotte metro area residential real estate experts. Nina - you are seeing what we are as well. Lack of inventory is the issue. And lack of inventory with strong demand leads to escalating prices. Hello Nina: Well, at least you have two months of inventory in Charlotte. That is something. Last summer our inventory dropped to 3 weeks in Sacramento, and I expect to see even more limited inventory in 2018. Elizabeth Weintraub Sacramento Real Estate Agent, Top 1% of Lyon Agents ~ hi Elizabeth... the two months is a region average and the region is huge. In many parts of the immediate Charlotte area, it's barely one month... and in some areas after you factor out new contruction we are talking about a half month's inventory. Lynnea Miller ~ hi Lynnea... not just rising prices, but slow downs in closed sales (at least here in our area). There's an entire category of buyer who can't afford a house anymore. Nice summary Nina Hollander that really provides great information to the consumer. The charts are really great too! Nice job..
Nina except for the inventory everything else is coming up roses in the North Carolina Region!!! This is new Nina Hollander! I like your quick facts market report! It's always good to see that all is well in the Charlotte area and that my friend Nina is hopefully getting plenty of business! Brian England ~ all is well in Charlotte-land... but a bit more business never hurts, no matter how busy I am. Paul S. Henderson, REALTOR®,CRS, ~ hi Paul... thanks, I do this each year to recap results of the prior year. George Souto ~ hi George... we are desperate for inventory. I wish you could send us some of your houses to sell! Gloria Valvasori, Accredited Senior Agent ~ thanks, Gloria. The charts come out of our MLS... too many agents just don't know how to use the wealth of information we have at our fingertips to provide to our clients and public. Nina, great information in the reporting of Charlotte's quick facts on the real estate market. 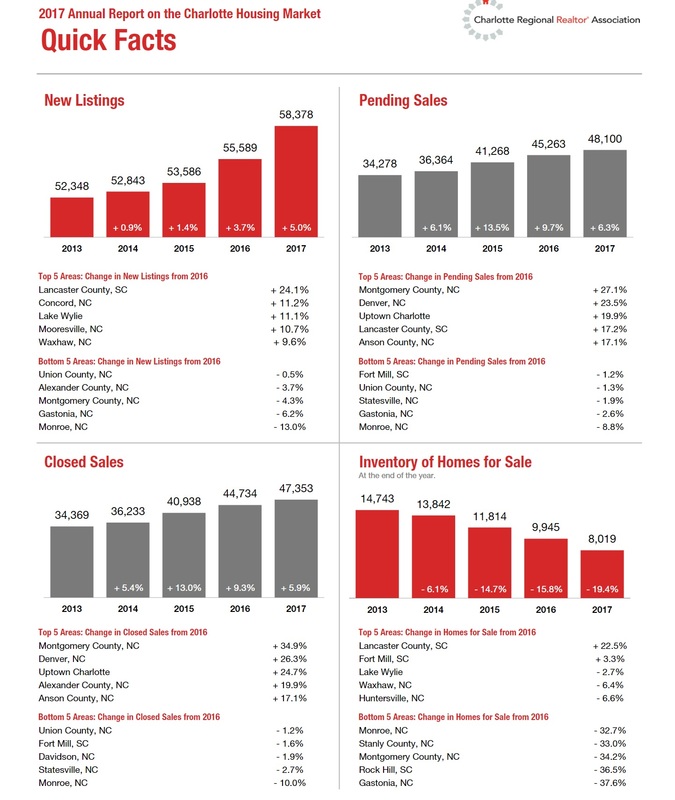 Nina, nice update to show how Charlotte's real estate market is truly on fire, and all good news, except thininventory! Rebecca Gaujot ~ thanks, Rebecca.... appreciate your popping by and taking time to leave a comment. Happy weekend! Joan Cox ~ good morning, Joan... that thinventory is really beginning to impact sales here. Roy Kelley ~ thanks, Roy. Hope you are staying warm. Friday it was 70 degrees here in Charlotte and now it's 23 degrees! No wonder everyone is sick!